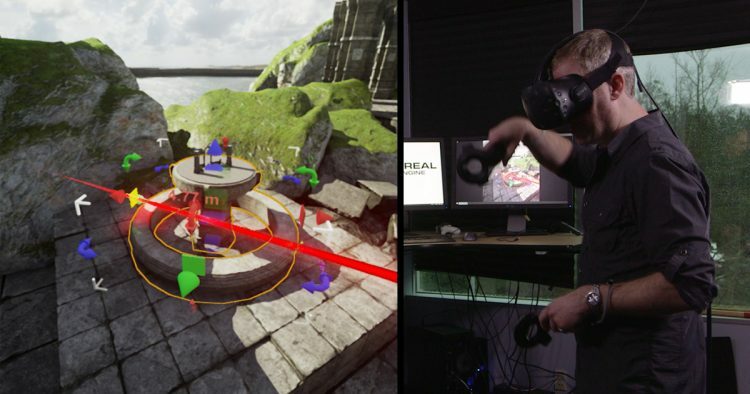 Epic Games is using the Game Developers Conference (GDC) to give an advanced preview of the latest additions to its Unreal Engine VR Editor, which allows creatives to build worlds in a virtual reality environment using the full capabilities of the editor toolset combined with interaction models designed specifically for VR world building. The goal is to officially launch the new VR Editor by April 17. Mike Fricker, technical director at Epic Games, told UploadVR that working directly in VR provides the proper sense of scale necessary to create realistic, believable worlds, while the use of motion controllers means artists and other non-programmers can build environments with natural motions and interactions. Epic’s own Robo Recall team used the VR Editor to build out the free pack-in game for the Oculus Rift with Touch, which also makes its complete debut at GDC this week. The Robo Recall team had a direct impact on the new VR Editor that everyone will have access to in April. Fricker said the team needed little power user features like the ability to snap objects right to the ground instantly without having to go grab them from a menu and move them down to the ground. Developing inside VR not only opens things to all members of a team, it also speeds up the development process. Lauren Ridge, tools programmer at Epic Games, said they’ve put in safeguards to ensure developers don’t get sick working within VR. For example, you can only move in rotation towards one direction. Not a single Epic user has ever had any motion sickness problems while in the VR Editor at the studio, where high-end PCs ensure a fast framerate. Ultimately, the VR Editor has been designed to allow creatives to do whatever they want. Epic showcased a complicated scene set on a beautiful beach during its GDC Keynote, which includes a surfing mini-game as well as a sea plane flying overhead. Moving the plane to a higher altitude is done in seconds by grabbing the plane and moving its trajectory. The GDC beach demo also shows how easy it is to access the Unreal editor UI in VR to change settings or change what types of plants you’re painting down for foliage painting. The brush has been improved and makes things like undo and redo more accessible with a quick action. Simulate mode allows developers to see how objects act when physics are attached. Ridge shows rocks of different sizes accurately falling off a cliff that overlooks the beach. The demo shows accurately built wooden 2x4s being snapped together into a staircase for a wooden hut on the beach. Epic has also partnered with Disney’s Pixar Animation Studio to have Unreal Engine 4 and the VR Editor support Pixar’s Universal Scene Description (USD) 3D graphics pipeline. Epic showed the coral reef from Finding Dory and characters Crush the sea turtle and Mr. Ray the manta ray running in UE4. Pixar wants to add more plug-ins for creatives beyond Autodesk Maya, so UE4 now opens up new opportunities for companies working in VR. ← Would Google Glass-style augmented reality work better on a smartwatch?